It’s still raining as I write this, but I thought I’d share the sunny side of the last seven days, as there was quite a bit of sunshine and it might cheer me up. Our first spot was Martin’s Haven, a National Trust spot at the end of the Dale peninsular. We drove down to the car park through single track lanes early in the morning to try to avoid meeting any cars coming in the other direction (this was where we picked up all of those pesky seeds that we had to clean off in the rain) and got parked up for free courtesy of our National Trust membership. However there were clear signs prohibiting overnight parking, and although we would have got away with it so long as we had left early the next morning before the parking attendants turned up, we decided not to chance it. We don’t really like early mornings. While we were there though we took a walk around the peninsular to the village of Marloes (where there was a pub of course, for a quick pint). 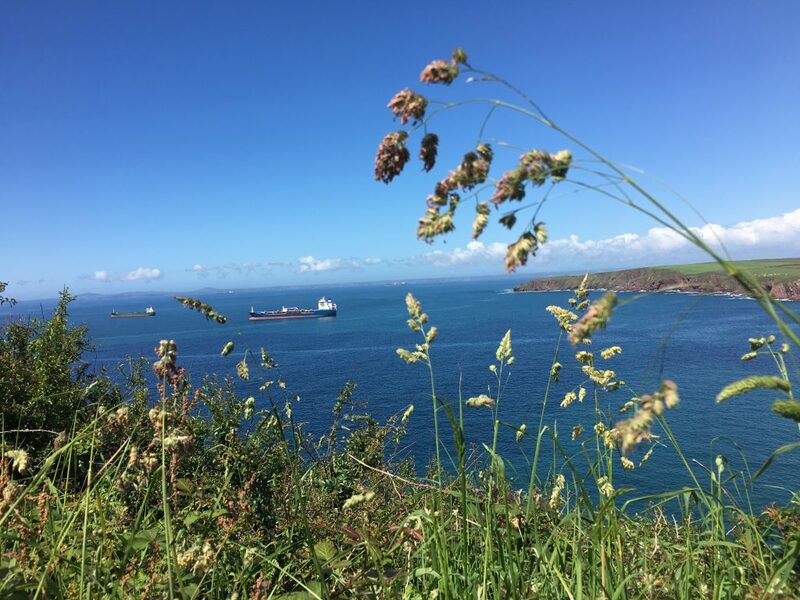 The views from the peninsular of Skomer Island were beautiful and the currents around the headland made for fascinating watching as they clashed and formed whirlpools. In the many inlets we saw seals bobbing about in the foam, just their dog-like heads poking above the water as they took shelter from the wilder waters of the open sea. We could have launched the kayak from the sheltered beach at Martin’s Haven, but after our walk we were a bit tired so we contented ourselves with watching a couple of other motorhomers in their sea kayaks (which are lean and efficient for cutting through the waves, unlike our fat but stable sit-on-top kayak). Our next potential spot for a bit of Kayaking was Dale, a free parking spot just before the village next to the lagoon which sits behind the bay. We drove from Martin’s Haven the short distance to Dale. This time we weren’t so lucky in the narrow lanes and met a local bus service, the ‘Puffin Shuttle’, head on. The bus driver was very friendly though and reversed up to let us pass – they must get used to it. 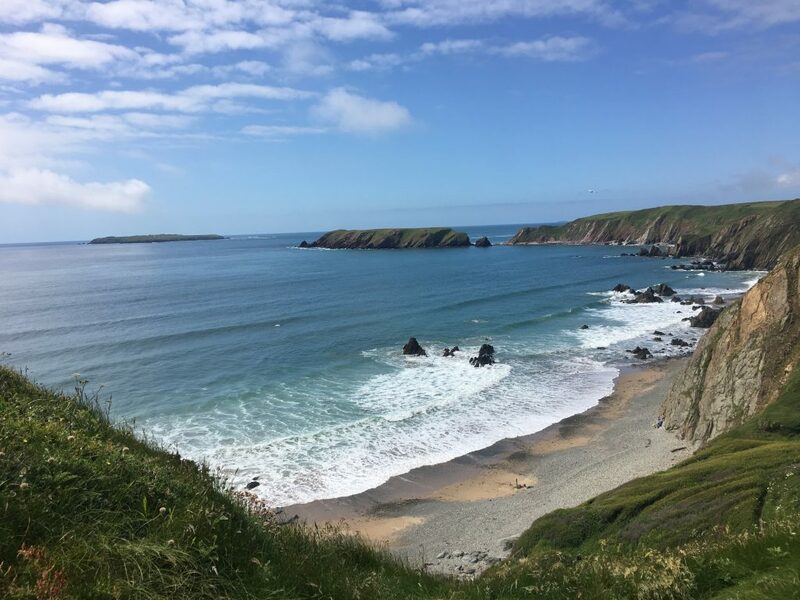 This was our first encounter with the Pembrokeshire coastal bus services which are a fabulous service for walkers as well as locals, covering the majority of the coastline of Pembrokeshire and enabling you to do walks in one direction rather than having to go there and back again. A single ticket is only £1.70 which is a bargain. We quickly learned to check their timetables to avoid meeting them in difficult spots. 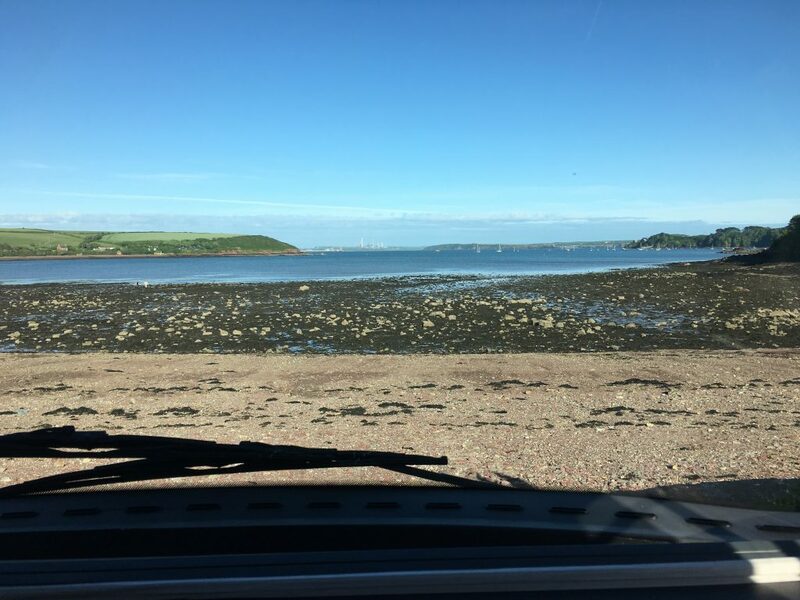 When we got to the carpark near Dale it was low tide and the water was a distance across mud and sand, so we didn’t know how great it would be for launching, but we made our dinner and watched the shore from Bertie and gradually the tide came in and covered the bay. As the sun set, we could see the lights of the industrial facilities at Milford Haven twinkling in the distance. We kayaked around the bay the following day, zig-zagging across the bay in search of the perfect fishing spot, but no luck with the fish. We stopped on the beach at Dale village itself to watch other people indulging in various watersports; kayaking, sailing, SUP and fishing. No one else was having any luck with the fish either so at least we weren’t alone. By the time we got back to our parking spot about four hours later my arms were aching, Paul often compares my arms to those of a tyrannosaurus – of no known use for anything (how insulting), but I agree I relied on him to do a lot of the hard work. Because we hadn’t caught any fish we cycled up to a nearby house where they were selling lobsters and crab from an outbuilding in the garden, and picked up a couple of crabs for tea, yum. We’d now had four nights of wild camping on the trot and the toilet was getting dangerously full, we had obviously made more use of public toilets last time. So we booked up a campsite near St Davids, we also knew that the rain and strong winds were due in so felt more comfortable hunkering down in a campsite. 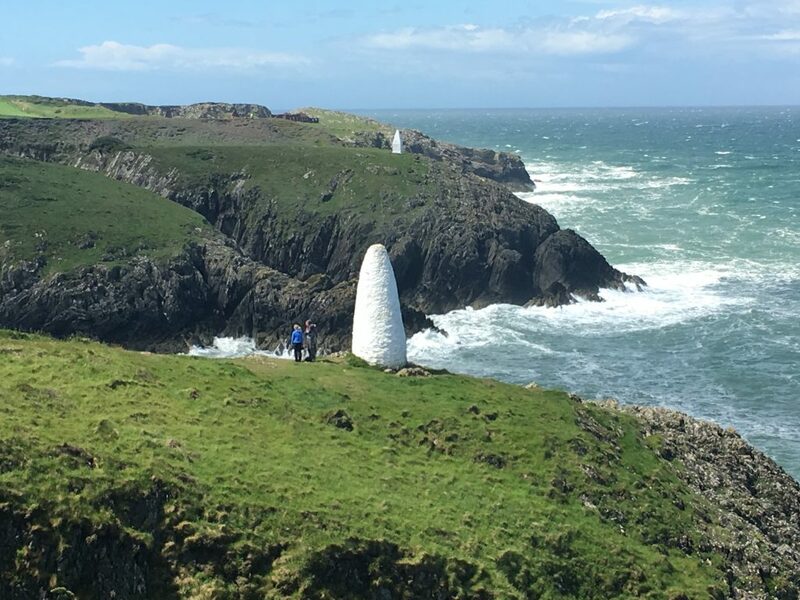 When we got the campsite there was still an afternoon of good weather to take advantage of, so we walked around the coast from St David’s searching for good fishing spots. 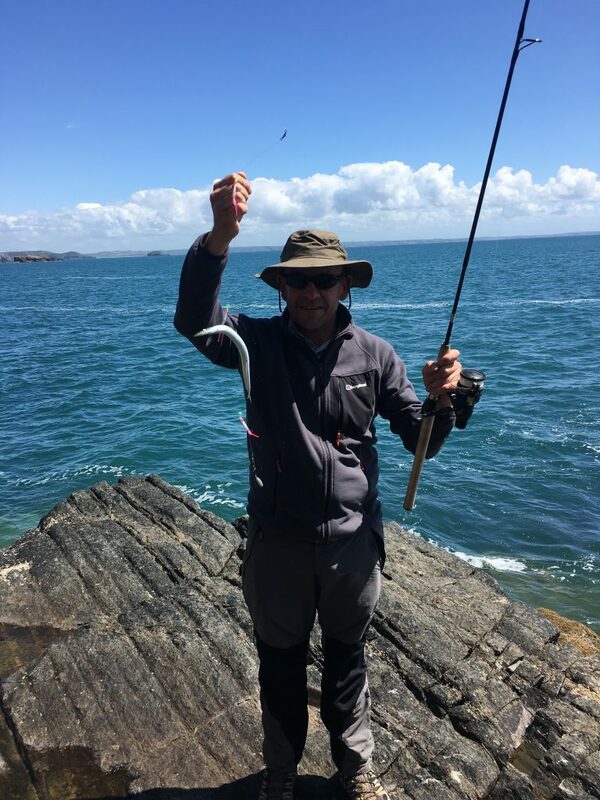 This time Paul was fishing from the rocks rather than the kayak, and he had a bit more success, but still no Mackerel for my tea, just a couple of launce and a small pollack that had to go back in the water. Our last spell of good weather and our last couple of days on the Pembrokeshire coast were spent walking, the first day we walked along the coast from Abereiddi through the pretty villages of Porthgain and Abercastle before getting the coastal bus back, the second day we walked around Dinas Head. The coast between Abereiddi and Abercastle has many relics of the slate mining industry; old quarry sites, including the blue lagoon where a school group were having fun (I think that’s what the screams were) jumping into the deep water, ruined mine buildings and the harbours which had at one time been important transport links and are now quiet pretty villages that seemed to be mostly holiday lets or second homes. Dinas Head on the other hand was wilder and we sat on the edge of the cliffs watching the sea birds on their rocky islet, gulls and guillemots sat on the rocks or bobbed up and down on the waves and a solitary gannet made it’s spectacular plunging dives into the sea. 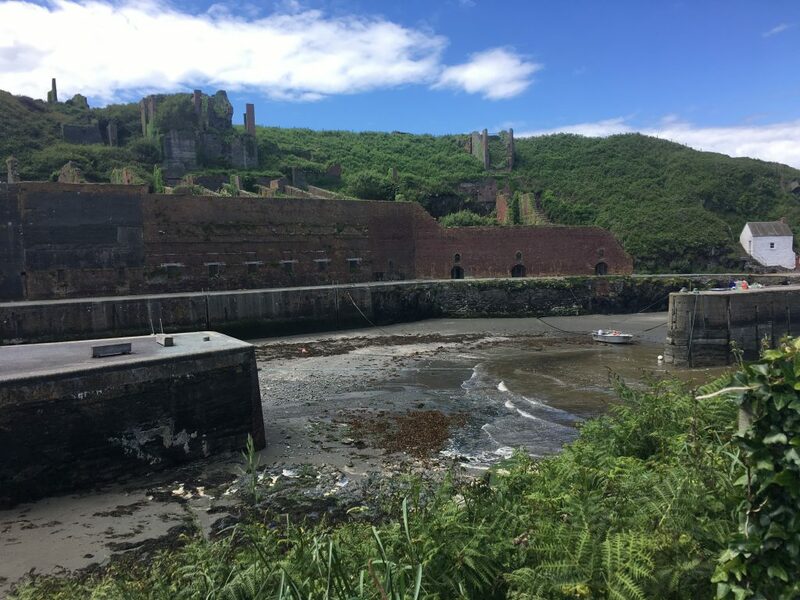 As you can see from the photos, we had plenty of good weather in between the rain, and that’s one thing our extended journey allows – we can take advantage of those good spells. Now we’re leaving the Pembrokeshire cost behind us as we head inland for a bit of a change.